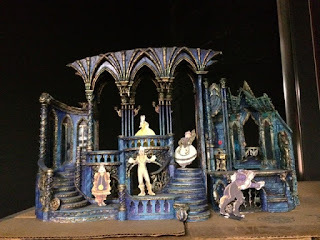 As part of the Disney Social Media Moms Celebration On the Road event in New York City, we were treated to a backstage tour of the New Amsterdam theatre. Currently, the New Amsterdam Theatre, located on 7th Avenue and 42nd Street, is home to Disney’s Broadway hit, Aladdin. While the show is relatively new to Broadway, the New Amsterdam theatre has a rich history and Disney has a tradition on Broadway that spans more than two decades. We learned how they make miniature stages to plan out scenery and character placement. The theatre itself was built in 1903 in the Art Nouveau style. I’m not an architect or an artist, but I can say that it’s beautiful. To give you an idea of the opulence and beauty inside the theater, it cost more than a million dollars to build back at the turn of the 20th century - think about how much that was back then! Inside the theatre soft, muted colors and natural theming abound. The theatre is also curvilinear meaning that you will rarely find a straight line inside. While the theatre's history on Broadway has both its ups and downs, Disney has worked with the City of New York to restore this gem and keep it a treasured landmark of Old Broadway. 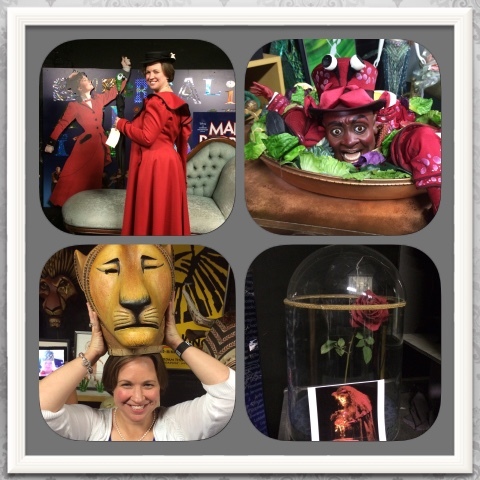 Our tour guide shared lots of details about each Disney on Broadway show. Enough of the history – let’s get to the fun stuff! Disney on Broadway offers a Behind the Magic Tour of the theatre to groups of 10 or more. We were treated to this unique and entertaining tour as part of our day. The highlight of the tour (for me at least) was visiting the prop room. Not only did we get the chance to see Broadway props and costumes from hits like Beauty and the Beast, Mary Poppins, The Little Mermaid, and The Lion King, but we also got to try them on and play with them. 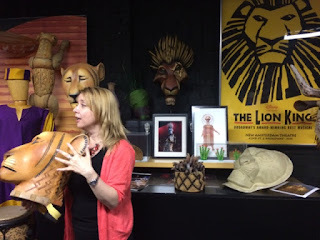 Fun fact – the lioness headdress that I’m wearing below costs $7,000! The prop room was nothing short of amazing! A big part of what I love about Disney is they know how to tap into the kid in all of us. While I haven’t had the chance to see a Disney production on Broadway before, I now have a new appreciation for the work of the Disney team to bring magic to life each and every night. I hope to be back soon for a night out on the town!